BANGI, 29 Oct. 2010 – The world would be a better place if all companies were to aim for the “triple” bottom lines of measurable performance indicators in the areas of environment, social, economics or finance, the Pro-Chancellor of Universiti Kebangsaan Malaysia (UKM), Tunku Laxamana Tunku Dato’ Seri Utama Naquiyuddin Ibni Almarhum Tuanku Ja’afar said today. He said the challenge for business today is how to account for the impact of business operations on employees, society and environment. “There is also increasing demand for business to assure that their mission statement integrates social responsibility in business policies and strategies,” he said when delivering his Royal Fellow Lecture of the Institute for Environment and Development (Lestari) of UKM, here. Tunku Naquiyuddin, who is also a leading Malaysian corporate leader with interests in Healthcare, Biotechnology, Power, Mining and Manufacturing, outlined the developments of the concept of Sustainable Development (SD) and philanthrocapitalism in his lecture. SD has also been linked with Corporate Social Responsibility (CSR) though some people saw it merely as a Public Relations tool, just like philanthrocapitalism. In line with this, he said businesses are generally run to meet the “triple bottom lines” of measurable performance indicators in the areas of environment, social, economics or finance. He said he was personally involved with SD in 1992 when he joined the Chief Executive Officers of giant international corporations from around the world in a forum called the “Business Council for Sustainable Development” (BCSD) to discuss exclusively about business and SD. He became a pioneer member of BCSD, which evolved with the United Nations Conference on Environment and Development, also known as the Rio Earth Summit of 1992. 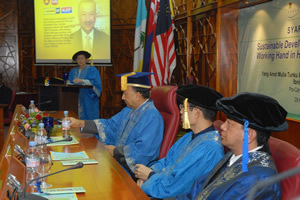 “We participated actively in the preparatory process of the UN Conference and looking beyond the immediate needs and interests of our business entities, and simultaneously consider the needs and interests of future generations,” said the member of the Negeri Sembilan royal family who had graduated with a B.Sc (Hons) in Economics from the University of Wales, where he also read International Politics. He said the significance of that meeting was that for the first time a group of business leaders had looked at the issues of SD from the global perspective and had reached major agreements on the need for an integrated approach in confronting the challenges of economic development and the environment. Their thoughts were put together in a book “Changing Course: A Global Perspective on Development and the Environment” in 1992 that is a collective wisdom and concerns of businessmen on matters of the environment, industrialisation, poverty and economic growth. In “Changing Course”, he said they had outlined a movement or a plan for business that could have far-reaching consequences for most business people. He himself had mooted the idea that “sustainable development has a vital role to play in reminding businessmen that their business strategy should always incorporate environmental protection as a major principle” in the book within the context of world economic growth. Tunku Naquiyuddin also said that World BCSD is today a movement led by CEOs, a global association of some 200 international companies dealing exclusively with business and SD. 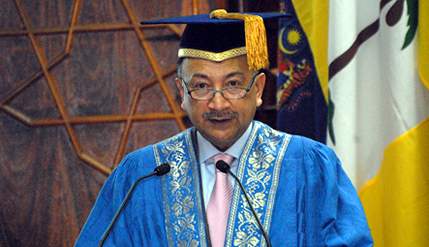 “BCSD had created a platform, while business-centric, that fundamentally connects to something very personal because what can be more important to us than in wanting a good life, not only for ourselves in this lifetime, but also a legacy for our children, our progeny in the many lifetimes to come,” said Tunku Naquiyuddin who is a council member of BCSD. He said he was also in the forefront in the formation of BCSD Malaysia as he was deeply influenced by the declaration and mandate of the organisation and, based on his knowledge and personel conviction, he has ensured that his business practices are governed by SD measures. With his diverse business interests, it was not surprising that he had ventured into philanthrocapitalism, which goes hand-in-hand with SD, a spin off from philanthropy. “Basically we are looking at a brand new generation of philanthropists who spend their money prudently as to gain powerful results and changing the way philanthropy works. 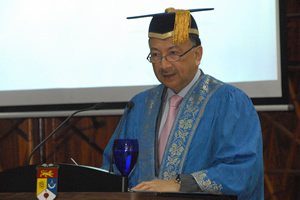 So came the creation of Yayasan Tunku Naquiyuddin, a practice in philanthrocapitalism through education,” he added. While there is a great potential for all of them to play an effective role in SD and philanthrocapitalism, the latter might need a nudge or incentive from the authorities to encourage its further development. “In conclusion, whether it’s SD or philanthrocapitalism, it requires commitment, determination and perseverance. The world will be a better place if all companies can subscribe to these ideals. “However, it also requires the pivotal support of governments, businesses and society to come together so that ‘changing course’ can be a real success without disruption and impediment,” he added.